Croatia has it all: rugged coves, pristine beaches, medieval towns and natural wonders, making it the perfect holiday destination for adventurers and sun worshippers alike. There is so much to do and see in this beautiful country that it would be impossible to do it all in one short trip. To narrow it down for you, here are 10 things you cannot miss when visiting Croatia! Korčula is a beautiful island of rugged coves and fragrant pine trees, the kind of place which instantly stole my heart. The town is idyllic with its waterside restaurants, medieval churches and some of the prettiest backstreets I’ve ever laid eyes on. Take a day to meander all of the cobbled streets and have a leisurely lunch beneath the pines. The best way to explore the rest of the island and all of its hidden corners is by hiring a scooter or quad bike. It may be a steep and arduous incline, but the views which await at the top are worth every second of the walk. 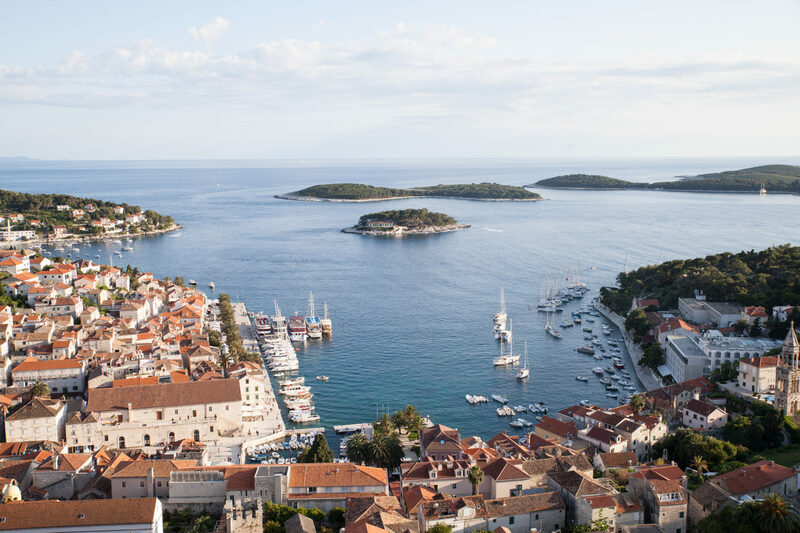 The panorama overlooks the old town of Hvar, the marina and the cluster of Pakleni Islands. Go at sunset for a golden glow over the terracotta-hued rooftops. 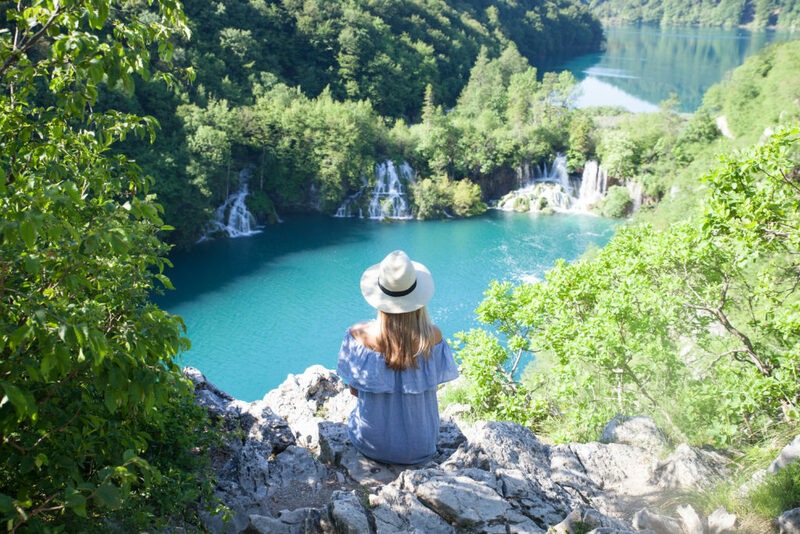 Krka waterfall is the second most visited in Croatia, after Plitvice lakes, however what makes it so special is you can swim in the fresh waters beneath the powerful waterfall. The water is cold, but how could you not take a dip in such a surreal surrounding!? 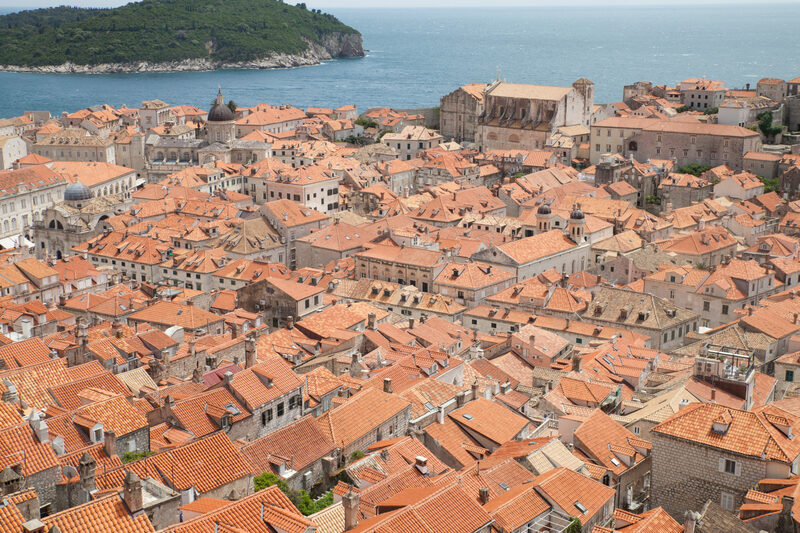 Dubrovnik is as pretty as a postcard with its winding backstreets, orange-hued rooftops and medieval architecture. The best way to see the city and the surrounding Adriatic sea is by walking the city walls. Plitvice lakes had been high on my bucket list for as long as I can remember so I was so happy to finally tick them off. Standing atop the cliff edge watching the powerful waterfalls cascade below was one of the most surreal moments of the trip. The lakes are overwhelmingly big, you could easily spend a whole day or multiple days exploring. Plitvice lakes is one of the most visited sights in Croatia, so be prepared for lots of people, especially in the summer months. Come early and be the first to enter so that you have the lakes all to yourself to appreciate them at their most tranquil. Trogir is a city built within medieval walls and surrounded by water. It has earned itself UNESCO world heritage status for its Romanesque and Renaissance architecture. 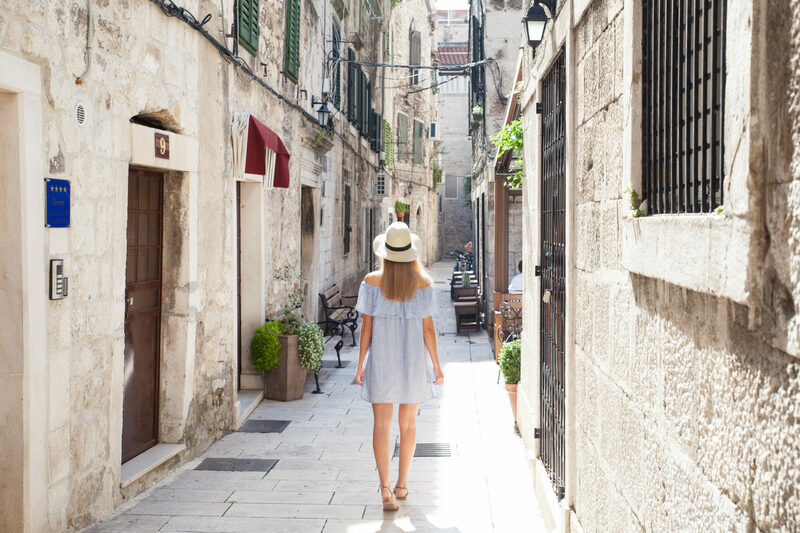 Spend a day weaving in and out of the cobbled backstreets, stocking up on Croatian olive oil and climbing the fortress for views over the historic city center. Šibenik is home to Croatia’s best restaurant: Peligrini. It has earned this award for the second year in a row at the annual Dobri restaurant awards. On the menu you’ll find traditional Croatian dishes with a twist such as truffle and prosciutto pasta with sheep’s cheese and lamb with paprika puree. 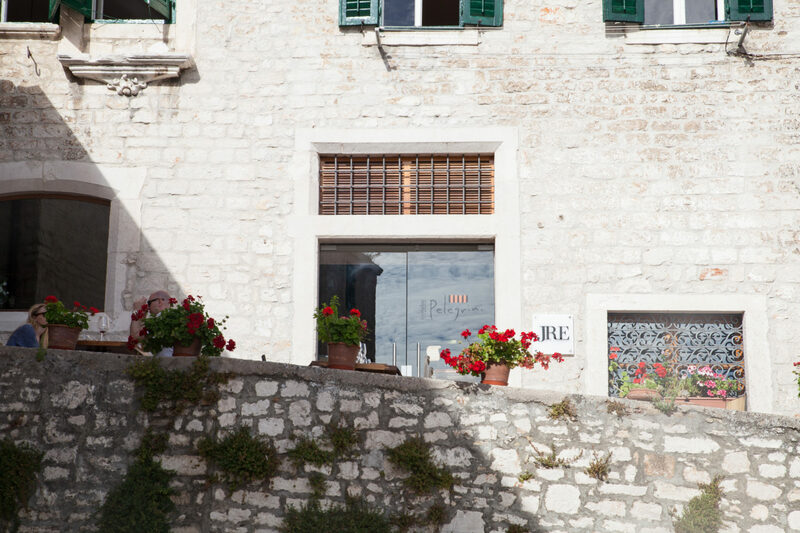 The restaurant prides itself on the quality of ingredients sourced in Croatia, as well its Dalmatian wine list. Whilst there make sure to explore the beautiful town of Šibenik, climb the fortress and visit St James’ cathedral. 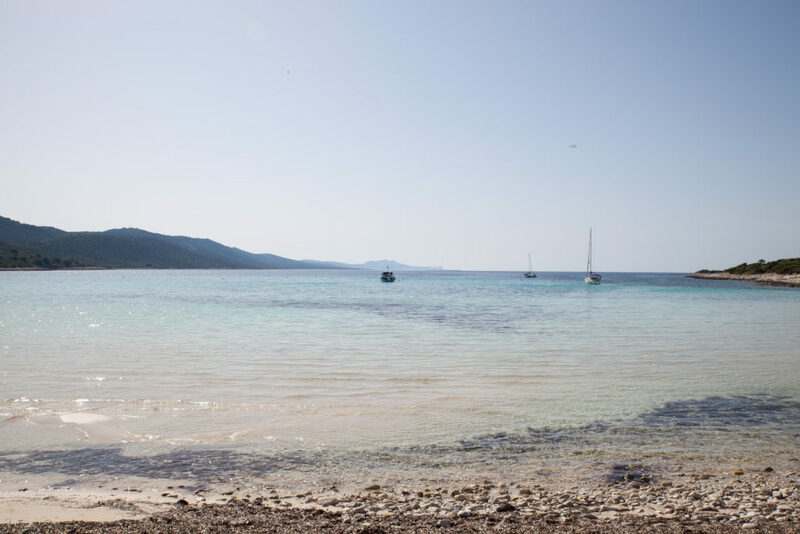 Dugi Otok is completely off the radar making it the perfect island getaway. There are no chic bars, no fine dining, few commodities but there are also very little tourists so you’ll feel as though the island is all yours. 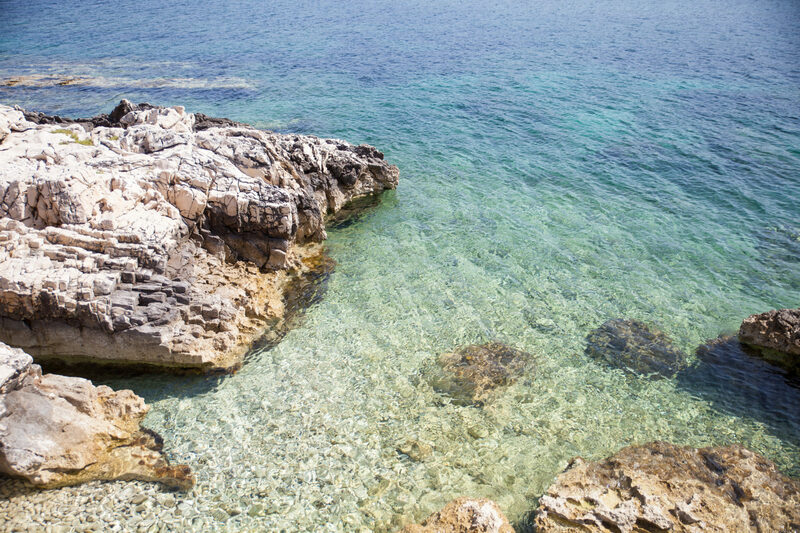 Visit idyllic beaches such as Sakarun and explore its rugged beauty by visiting Telašćica Nature Park. Croatia’s beaches are sites of beauty. The colour of the sea varies from deep turquoise to emerald and often the beaches are surrounded by pine trees and verdant trees. The Adriatic sea is one of the best in the Med with its beautiful colour and underwater life so be sure to swim in it as often as you can. Often overlooked and used as a jumping point to Croatia’s islands, Split is not only the best connected town for catching ferries but it is also a very pretty town. 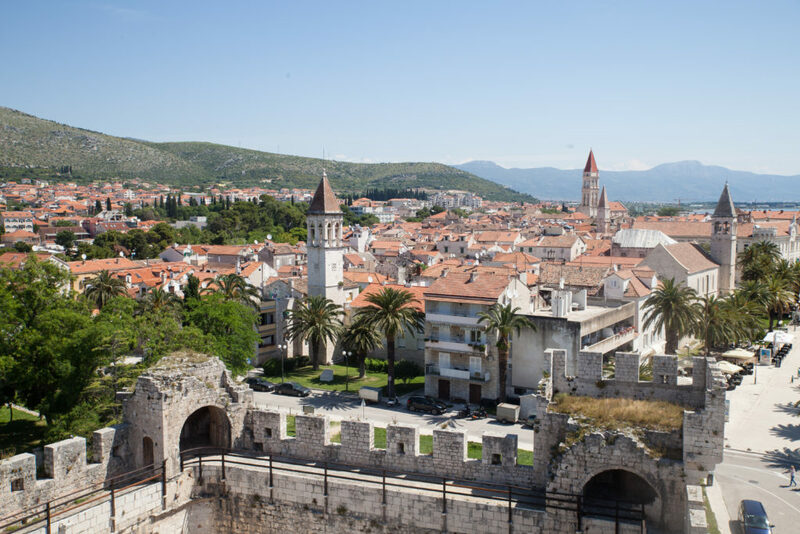 Climb the bell tower for panoramic views over the city, have dinner in Diocletian’s Palace and explore the cobbled backstreets and you’re sure to fall under its charm. Incredible images. Croatia looks amazing. I’ve been wanting to go to Croatia since forever. Lately everyone seems to be going! That’s it, next years big trip will definitly be Croatia. Your photos are gorgeous, Brooke! Great list of places! I would also suggest Rovinj. I spent a few days there last September and I enjoyed myself so much. It was a nice and peaceful day after hiking all around Europe. I already have Croatia on my bucket list and this post makes me want to visit even more. I love all the places you’ve mentioned. I can also highly recommend Istria as a great place to visit. It’s different because as well as the islands and old coastal towns you also have places like Montovun which is a town built on top of a hill with spectacular views. Porec has a UNESCO site in its basilica as well as the rocky beaches you find along the Adriatic. Istria is my personal favourite place in Croatia as it food wise it has remnants of its Italian past with Italian food and its Austrian past with its Austrian food, the strudel there is to die for! Plitvice Lakes is definitely on my bucket list. I plan on making a long trip to Europe next year…definitely pinning this post for future trip planning! That Plitvace lake is really gorgeous! This article brings back fond memories of Croatia, and I also want to recommend spending a few days in friendly Slovenia too. We weren’t planning to go, but our guidebook included both and we ended up loving Slovenia even more than Croatia! Oh how beautiful!! We would love to travel to Croatia and esp. Plitvicer National Park! Have heard a lot about it recently and your photos are amazing! I am originally from Croatia (but am living in Amsterdam for the last 2,5 years) and yes, the country is amazing! The Adriatic cost is the most touristy in July and August, but the weather is also the best at that time of the year. It is also nice to visit it in June or September, because it is not so busy, but the weather is still good enough for the swimming and sunbathing. The best thing about Croatia is that is so diverse, so I’m definitely recommending to go to Zagreb (the capital), Gorski kotar (mountains/forests) or Hrvatsko zagorje (area north of Zagreb, very rural, but green and beautiful with many nice castles). I’m going there in a week and I’m super excited about it! Croatia never gets old…That’s why I keep going back! The one place I would definitely add to this list is Rovinj..the most picturesque streets and overall irresistible charm. Actually, the whole Istria region, especially Motovun and Grožnjan. Croatia is just spectacular! I’ve been to Croatia twice, and it’s one of my favorite countries–seriously stunning! I missed Plitvice Lakes on both trips though, so I guess I’ll have to go back 🙂 One thing I’d add is visiting the Museum of Broken Relationships in Zagreb. One of the most interesting museums I’ve ever been to! Great article and amazing picture. Been thinking of going to Croatia next summer and now I want to plan a trip there even more! Looks beautiful! I was in Dubrovnik as well… But I enjoyed the cable car more than the ancient wall as you get to go higher and have a better view. And you can sit in the restaurant which is directly on the hill. It was really nice. Croatia looks so beautiful and photogenic! Can’t wait to visit. Beautiful! Definitely next on my list. We have a ton of turquoise-coloured lakes in Canada, but most are pretty cold for swimming because they are glacier-fed. I need to experience warm turquoise waters soon! I’m OBSESSED with the Plitvice Lakes! They’re stunning. And if you’re into the party scene (like I was 5 years ago), the island of Pag is a must! I love Croatia! Wish I could have the time to just rent a car and drive around, exploring the country for a whole month! Croatia looks unreal! I’ve been wanting to go forever and your photos of the beautiful pristine waters make me wanderlust like no other! Every time I see something to do with Croatia it makes me want to go even more! What is the best time of year to visit? I imagine it gets pretty hot and touristy June-August.